Sometimes doing something good requires giving of your time and money. Sometimes all it takes is giving your trash. 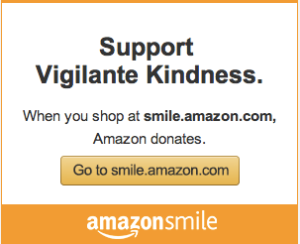 At Vigilante Kindness, we want to pursue self-sustaining educational and employment opportunities with and for people in developing countries throughout the world, but we also want to do that in a way that takes care of the world itself. Enter the Vigilante Kindness Recycling Drive. You may already know that we’re recycling magazines to help the women of Te Okot make paper bead jewelry to sell so they can earn a sustainable income. We’ve added a few items to our list and 100% of the proceeds from the recycled items will go toward Vigilante Kindness general fund. 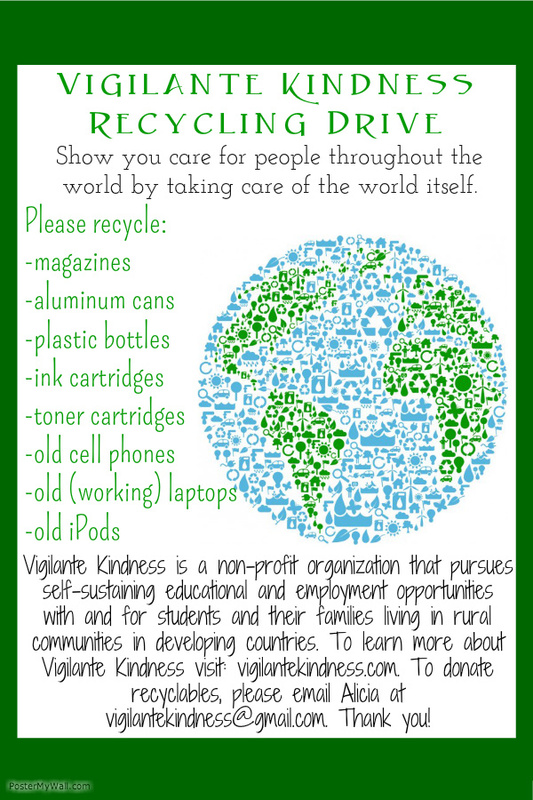 Want to collect recyclables at your workplace, your school, your church or any other location for Vigilante Kindness? Here’s a printable flyer for you to attach to the container of your choice. If you live in the Redding area, when your container is full, just shoot us an email (vigilantekindness@gmail.com) and we’ll come collect your recyclables. If you live outside of the area, but would like to join the recycling drive, shoot us an email and we’ll get you all set up. Thanks for helping us care for the people we love throughout the world in ways that also help care for the world itself. My phone had been pinging all day long. As I walked to my car that afternoon, I checked my messages and laughed at the group conversation my boys had been having while I was at work. Normally I loathe group texts, group conversations and the straight EVIL that is the Reply All button. But the conversation between my boys tickled me. I struggled to translate their conversation from Acoli into English, but when I did, I saw that there were 28–yes, 28–messages about land prospects for the chicken farm, feed providers, which farmer they’ll buy the initial chicks from, etc. There were also teasing barbs, typical brotherly ribbing. Can I just tell you how much my heart loves the teasing they do? My formerly orphaned boys tease each other like brothers do and it’s music to my ears. I read along as their messages progressed into the evening in Uganda and when they settled down for the night and messaged a chorus of I love yous to each other, it was all I could do to scoop my puddled heart up off the floor. Because of you, Vigilantes, my boys were starting to see that their Chicken Farm Project wasn’t just a dream. Me? I wish I had their faith. I’d spent the previous night looking at the Chicken Farm Project donation thermometer, incredibly grateful for the $51 that had been donated, but also trying to come up with ways to make that thermometer fill up to the tippy top. Little did I know, on that very night, as I sat trying to think of ways to make this project happen, and the following morning as my boys chattered away about all things chicken, a Vigilante woman was praying about my boys and their future chicken farm. This woman has asked to remain anonymous, so let me tell you just a little about her. She’s a cancer survivor. She volunteers at her local hospital. She takes in foster kids. She loves with her heart wide open. After I finished translating the 28 messages from my boys, I received this message from this Vigilante woman. I read her message again. She’d decided to fund the remainder of the ENTIRE CHICKEN FARM PROJECT. I called her immediately and before the first ring, I was crying, snot dripping, mascara running, ugly crying. I left her a blubbering voicemail and then called my mom, who cried right along with me. I still laugh at the whole idea of this chicken farm. Really, God? You want me, the girl who is terrified of birds, to help my boys start a chicken farm in Uganda? Chickens? Really? Of course. God’s sense of humor is obviously fully in tact. God’s sense of compassion is also fully in tact. I know this to be true because three formerly orphaned boys have not only taken up residence in my heart, but in your hearts, too. My boys still struggle with the residual pain of being orphaned. Of being left by parents who died too young. Of being unloved. Of being treated like dogs. Of being children left to fend for themselves on the streets. Of being unclaimed. I sit here fighting back tears again because you, sweet Vigilantes, whether you donated a single penny or a lot of pennies, have claimed me, claimed my boys, and claimed a whole lot of chickens, too. Want to see something wonderful before you go? I received a Christmas gift last week and the timing was nothing short of perfection. Last Tuesday night we had our first Vigilante Kindness board meeting. I’d prepared for it and had a long list of tasks our new board needed to tackle. I’d worked hard at school the day before to make sure I’d be able to leave on time Tuesday and finish any last-minute preparations. Every i was dotted, every t was crossed. Then Tuesday came and it was a TRAIN WRECK. After being out sick the entire week before, I’d worked hard on Monday and Tuesday to reconnect with my kids, to re-establish classroom routines that had disappeared in the revolving door of substitute teachers that had taken care of my little ones that week. But Tuesday they were still justifiably on edge, unsettled and undone. After an exhausting day together, I sent them out the door with hugs and reassurance that I’d be there tomorrow and we’d all try again. After school, I felt drained of everything, like my tired tongue couldn’t utter a single syllable more. Each time I tried to leave school to go home, a colleague popped their head in my classroom and said, “Got a minute?” A minute is never a minute, especially when you’re bearing burdens with friends. I love my colleagues. They are air and light and my soft place to fall. I love that they come through my door when life is giving them the one-two punch. I’ve been there. I’ve been the bedraggled one walking through their doors, meekly asking for a spare minute. That evening I pulled into my garage and I had nothing left in my tank. I was bone dry, weary down through the marrow. Even walking across the street to the mailbox felt like a monumental task. I carried an armload of mail into the house and tossed it on the kitchen counter. I sat at the counter and looked over the agenda for our first board meeting. I scanned my pile paperwork and then I put my head down. It felt like it weighed a thousand pounds. I thought of my little ones who sometimes ask to take a minute to put their heads down at their desk, to have a moment of rest and a few seconds to recalibrate. I sat there with my head down and took a deep breath. In addition to my exhaustion, I felt a bubble of fear gurgle up from the pit of my stomach. I knew where that troublesome bubble came from. It came from the fear of releasing some of the responsibilities of Vigilante Kindness. It’s my baby, a beautiful bundle of joy of all the people I love here and all the people I love in Uganda. At the board meeting I’d be handing over pieces of that bundle to Laura and Colin. I wish you knew Laura and Colin in person. If you do, count yourself truly fortunate. They’ve supported Vigilante Kindness from its inception. They’ve been my cheerleaders and often my sounding boards. I knew my fear wasn’t about them. It was about the fact that it was time to unfurl my fingers and hand over pieces of this beautiful work. I knew it was time with every fiber of my being, but sometimes my heart is slow to follow. Know what I mean? So I sat there with my head on top of the pile of mail. That’s when I saw it, a small package from my friend, Bridgette. In January Bridgette and I attended a women’s retreat all about striking into areas where God is calling us. It was in the mountains of that retreat that I knew Vigilante Kindness was growing too big for me, that I alone didn’t have the gifts or talents needed to continue in the great direction Vigilante Kindness is going. It was humbling and hard to admit and at the same time, it was so good. The symbol for the retreat was an axe. You know it’s a hell of a women’s retreat when the symbol is an axe. I lifted my head from my pile of mail and opened the package. It was a Christmas card with a note. My favorite part of the note read, “This was supposed to be to you for Christmas. Oops! 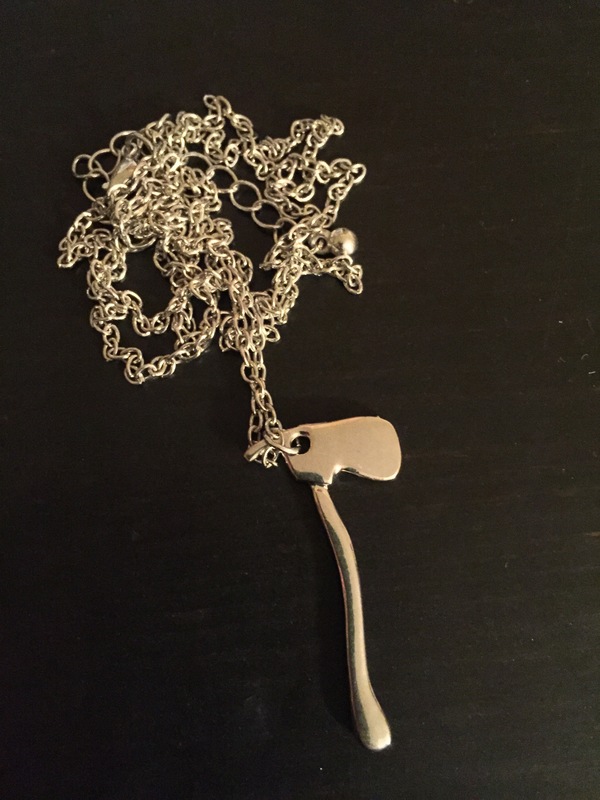 Better late than never.” Under the card was a little box and inside the box was a silver axe necklace. I put the necklace on and a minute later called our first Vigilante board meeting to order. Colin and Laura were their eager selves, asking questions, offering up suggestions of things I never would’ve thought of, and oh so patiently walking through all the details with me. At the end of our meeting, I felt lighter, like a huge weight had been lifted from my shoulders. This is the joy of what my friend Jenna calls creating in community. I now had Colin and Laura flanking me and opening their arms wide to this incredible work we all get to do together. The thought gives me goosebumps. Dear one, maybe you’re like me, a bit of a lone ranger, and a lot reluctant to let other people help you. Let me say to you with all the love in my heart, let that go. It’s not what we’re called to do. Jesus had a posse of twelve, for goodness sake. If the very Son of God needed people to walk with him, to help do the work, then I think it’s safe to say you and I do, too. It’s not lost on me that I came to our very first board meeting completely void and running well below empty. Of course, because, sweet Vigilantes, this work we get to do together isn’t about me. I’m not sure how many times I’ll have to learn that lesson. That night under the covers I waited for sleep wearing my new necklace. The axe rested below the hollow of my throat and I smiled thinking about my late Christmas gift that arrived at the perfect time, a reminder to me to keep following God into this wild adventure, but also reminding me that I’m not alone. Vigilantes, thank you for your constant and good company. Now grab your axe because we’re about to swing big.